Today the animated GIFs are popular than ever. The web is full of them. Animated GIFs with cats, dogs, fails, movies, tv shows, again cats, loops, cartoons, animals, santa, more cats, flicks, … There are numerous web sites full of such animated GIFs. Moreove, the web is full of tutorials for doing such animated GIFs. You can do them for free, in GIMP or you can pay some $$$ for Photoshop and get them done there. Because these tools are meant for other purposes, they are not very comfortable for an average user for making such GIFs. Some other folks are offering a web page were you can upload your frames and download the resulting animated GIFs. These are a bit uncomfortable too. This is why I started developing CinemaGIF. It took me 10 winter evenings to get it in a beta stage. CinemaGIF is a spare time project. I don’t work full time on this. There are no other people working on this project. Like my other project (GMS) this could become pretty popular too, but since I don’t do any advertising, this will happen only with your help. So, if you like it feel free to spread the word. It may happen that people will not agree with the fact that CinemaGIF is the most comfortable tool to make animated GIFs, but I’m committed to make it so. So, feel free to give your feedback when I’ll get some spare time if your feedback really makes sense toward this direction I’ll consider it and I’ll code it. 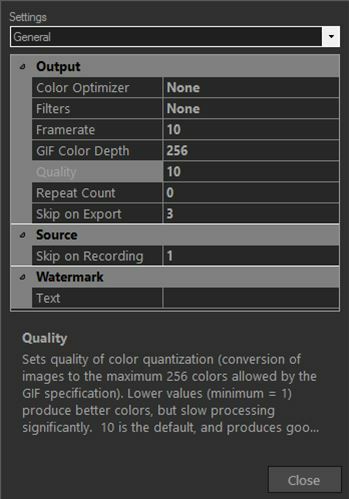 There are two versions of CinemaGIF: CinemaGIF Pro and Live. Here are the differences between the CinemaGIF Pro and Live. In the following section I will explain in few words how you can use CinemaGIF. Feel free to read it and start experimenting. Your imagination will give for sure many cool animated GIFs. Feel free to experiment various sequences, framerates, etc. Movie mode is used for capturing from a movie file.